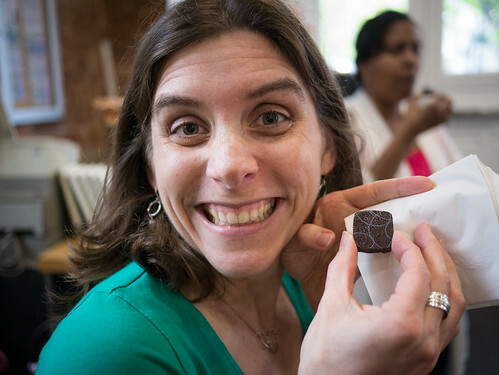 For Christmas, Jen got us tickets to a Chocolate Tour of DC in Georgetown. 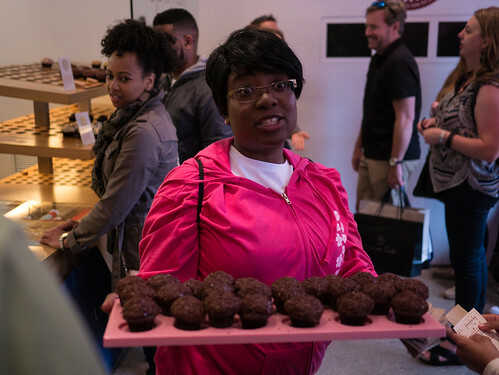 Here’s our fabulous tour guide, Linda, at our first stop, Sprinkles. Sprinkles is the cupcake place founded by the lady from Cupcake Wars. 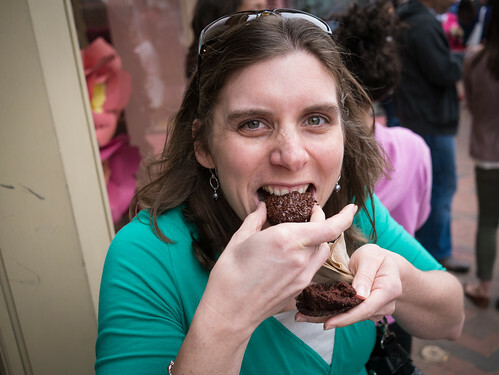 According to several folks, they’re better than Georgetown Cupcakes. After trying them, I think I agree. The second stop on the tour was my favorite - Thomas Sweet. 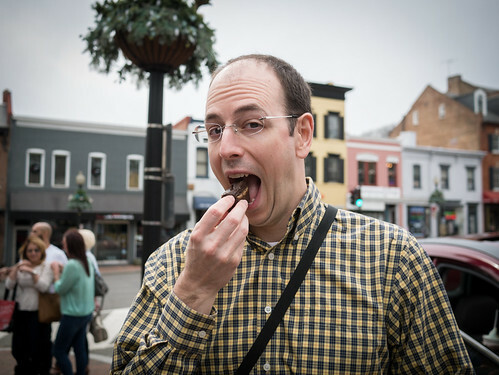 We had some of their fudge - dark chocolate with caramel in the middle and salt on top. It was outstanding - so good that I may have had a second helping. Next stop - Godiva for some basic chocolate. 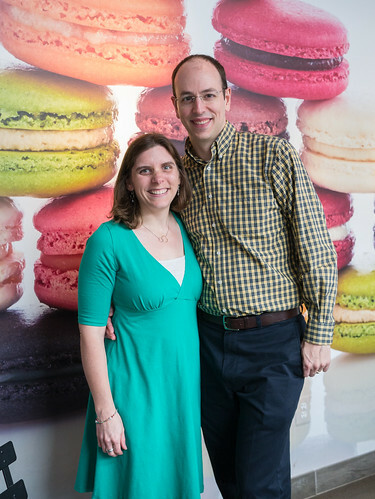 We then headed to Olivia Macaron for some delicate French macarons (not to be confused with macaroons). 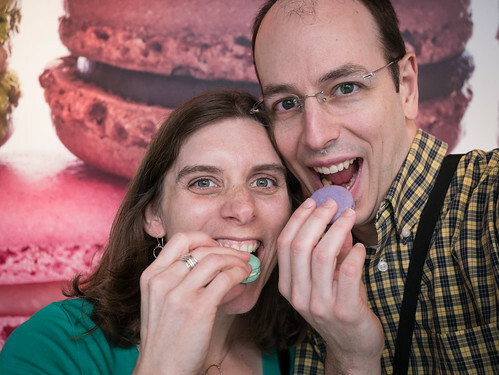 Note that macarons are commonly filled with chocolate ganache, which is why they qualify for the chocolate tour. Our tour guide was nice enough to take a picture of the two of us. It took her a second to do so, however, as she was interrupted by a woman who had followed us in off the street to ask Jen where she bought her dress. She was sad to learn that Jen had made the dress herself, so there was no chance of her purchasing it. 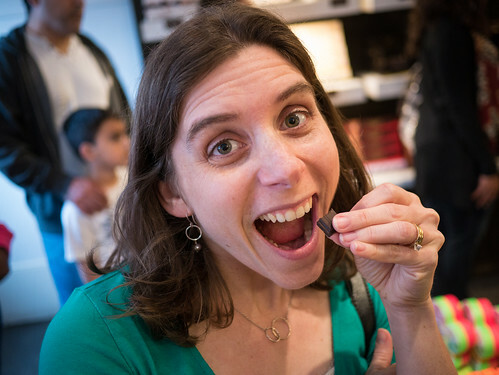 Our next stop was Dean & Deluca for some fancy chocolate from Bolivia. Our last stop was Pie Sisters, a great place with pies of all kinds. We had tiny chocolate pecan pies which were fantastic. And thus ended our delicious afternoon of chocolate. 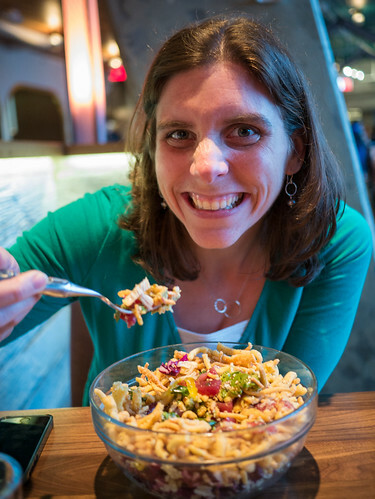 We didn’t have time to linger, though, as Jen had planned a fancy dinner immediately afterward. For dinner, we went to the very fancy Farmers Fishers Bakers. Jen got the Ahi Tuna Poke Salad and I got some very yummy Corvina. 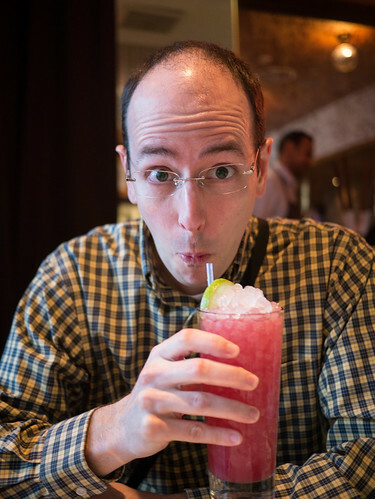 My favorite part of the dinner was this Hibiscus Lime Rickey. 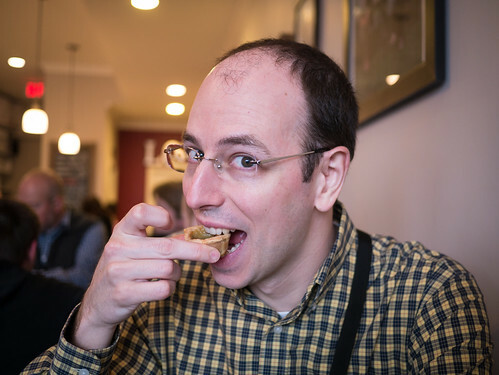 I knew it would be tart, but it exceeded my expectations. Wow! It was a wonderful outing for the two of us. 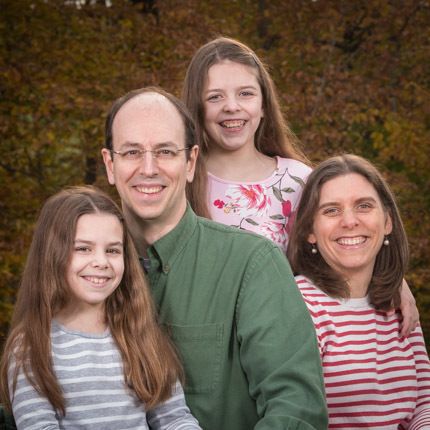 In case you were wondering where the girls were, they spent the day having tons of fun with Aunt EA and Uncle Scott who live pretty close to Georgetown. Their day included duckpin bowling, toys, Ledo Pizza, watching a movie, and eating cake. Thanks Aunt EA and Uncle Scott! We’ve had some fantastic weather lately. I’ve meant to take the sleds off the porch (where they live for the winter), but have not gotten to that. 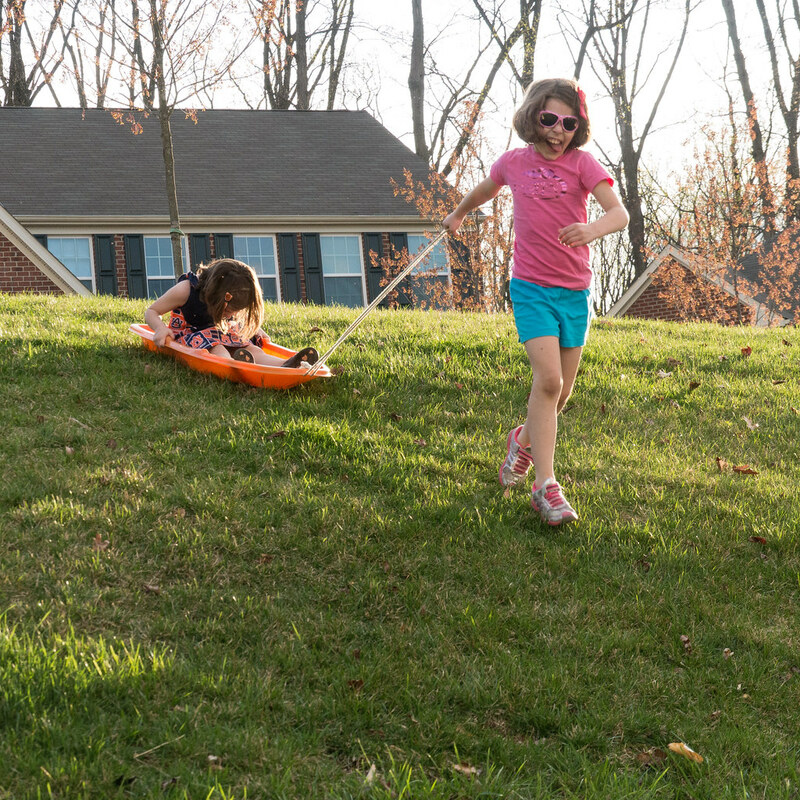 Yesterday, the girls decided that they didn’t need snow to sled. They climbed in one and tried to slide, but of course went nowhere. 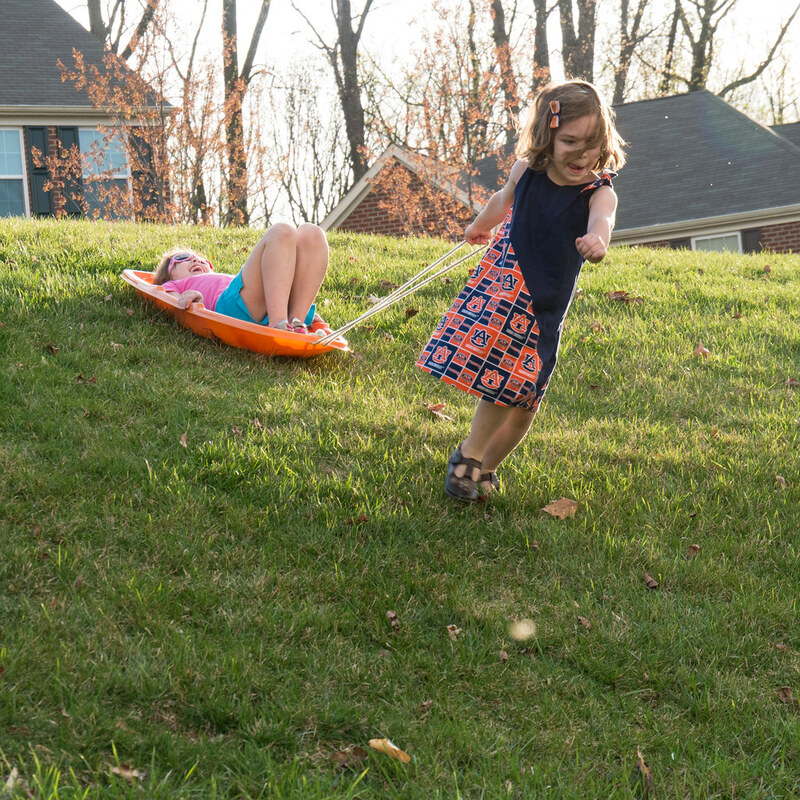 Then they discovered that if one of them pulled down the hill, they could move pretty well. They naturally took turns pulling/riding. 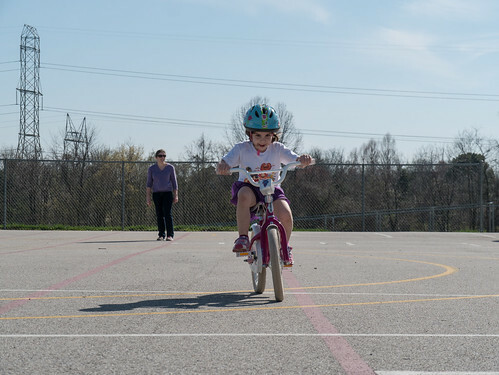 Here Leah has adopted a more aerodynamic pose in order to speed things along. 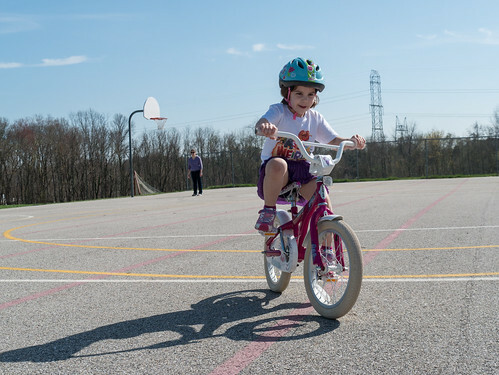 On our third attempt to do some bike riding this Spring, we finally got a perfect day. 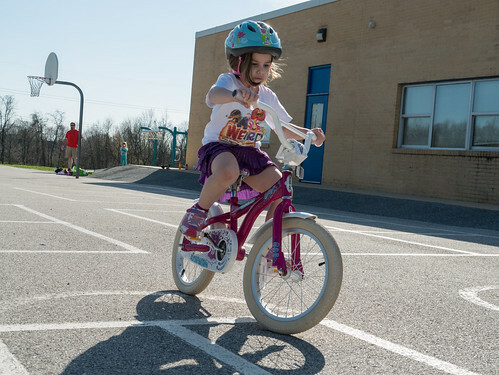 Leah took advantage of it and was riding her bike without training wheels in no time. Great job, Leah! Here she is in action. This video shows a bit of her progression after she started to get it. In the beginning, I would run alongside her in case she started to fall, but it didn’t take her long to decide she wanted to do it on her own. She was happy to get a little help to start (which Jen gave her here), but then the parent had to stay put while she zoomed around. 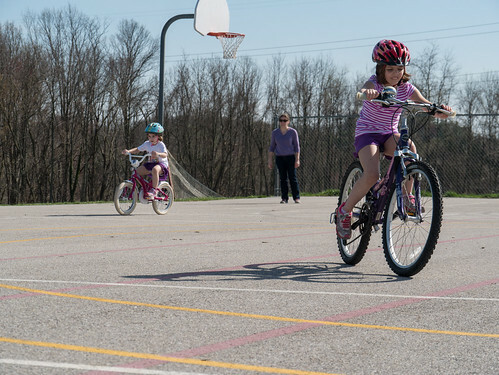 It was a great day of bike riding. We can’t wait to do it again. Did I make the girls Easter dresses? Nope. But I made one for myself! You may have caught a sneak peak of it on yesterday's post, but here's it in full view. Leah gave me the Washi Dress pattern for my birthday two years ago. I bought the fabric soon after, but never took the time to make the dress. 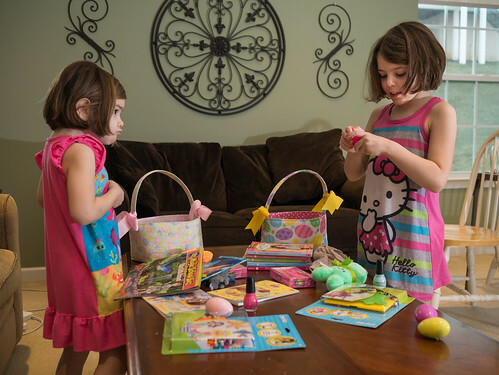 Since the girls we wearing smocked dresses made by their grandmothers, I thought the Easter sewing could be for me. On a side note, I'm twelve days in to a three week sewing hiatus. I brought my machine in for service over Spring Break, so I've been catching up on my reading and organizing around here. Hopefully, it'll be ready early as I keep adding to my project list for April! 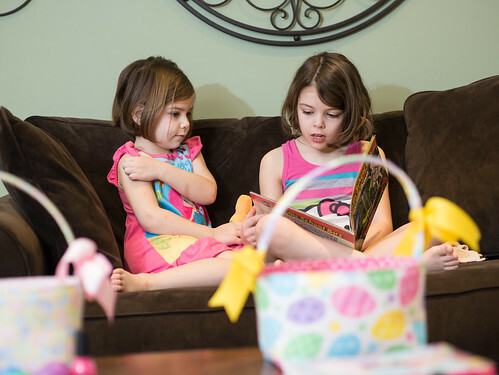 When Easter morning arrived, the girls were very excited to get downstairs (after the appointed time we set, of course) and see what the Easter Bunny had brought. 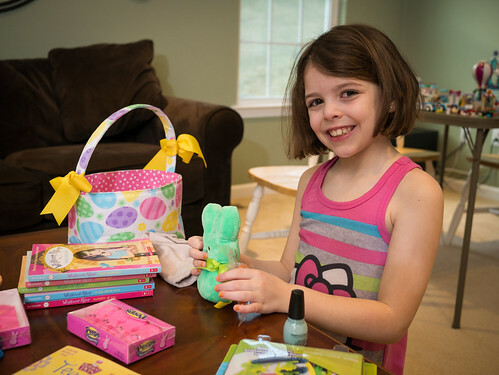 A big hit this year - Peep bunny stuffed toys. 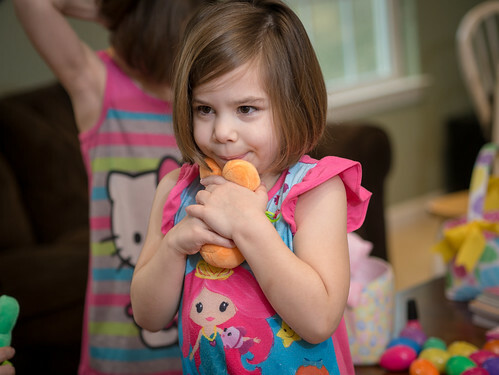 Leah loves her new Peep bunny. 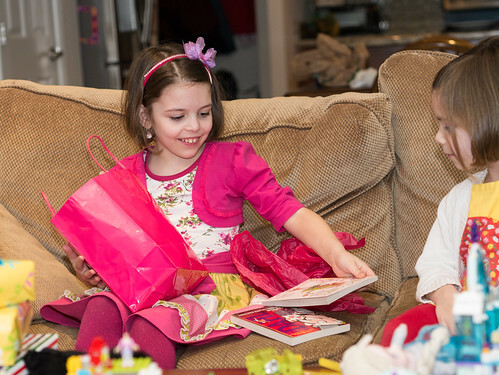 They received a bunch of books, so it wasn’t long before they sat down to read a bit. 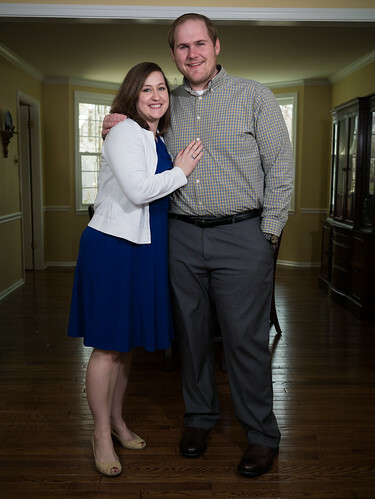 We then got dressed and headed to church for Easter service. Then, on to Grams’s house for some family time. While there, we took a photo of the four of us. We’ve never had a successful family picture taken so quickly. 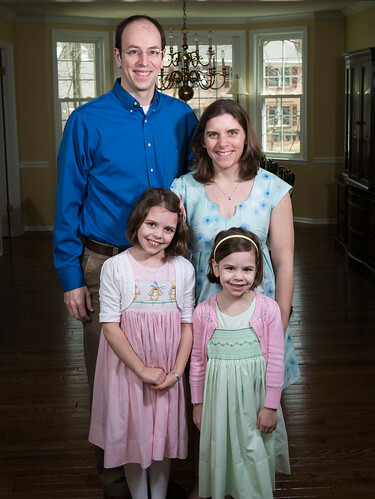 Uncle Scott must have been working some magic behind the camera to get nice smiles out of Molly and Leah so quickly. I brought and set up a portable studio for the previous shot (just a simple 2 flash setup), so I asked if anyone else wanted their picture taken as well while it was set up. Aunt EA and Uncle Scott were happy to have their portrait taken as well. Then it was time for some food and family fun. Happy Easter everyone! 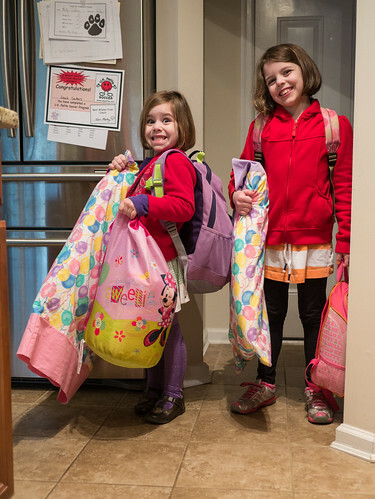 The day after Molly’s birthday, Molly and Leah headed out to their first sleepover with friends away from home. They went to the home of their long time (their entire lives) friends Allison and Rachel. They did great - so well that we didn’t even hear from them until Jen picked them up the next morning. They can’t wait to do it again. By the time Molly’s actual birthday rolled around, most of the celebrations had ended. 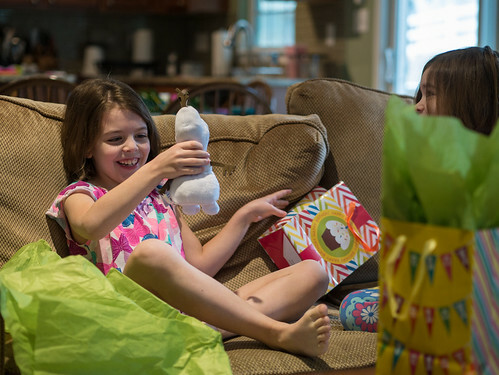 But she still had a couple presents to open from Leah, including the one she’d been hoping for - a stuffed Olaf. For dinner on her birthday, Molly requested hot dogs. 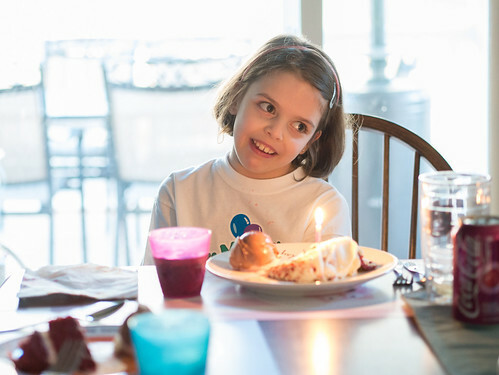 Afterward, we broke out the leftover cake and ice cream from a couple nights ago and sang to her one more time. Molly is now officially 8 years old. Happy Birthday, Molly! 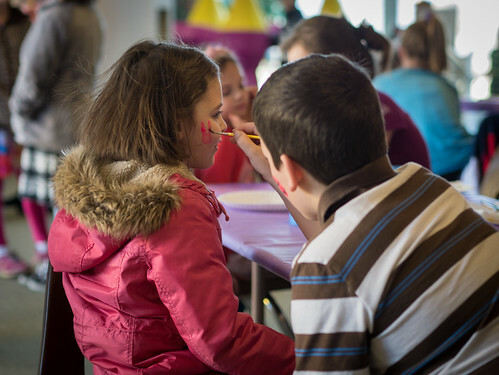 Our church had an Easter Egg-stravaganza the week before Easter, including lots of fun. 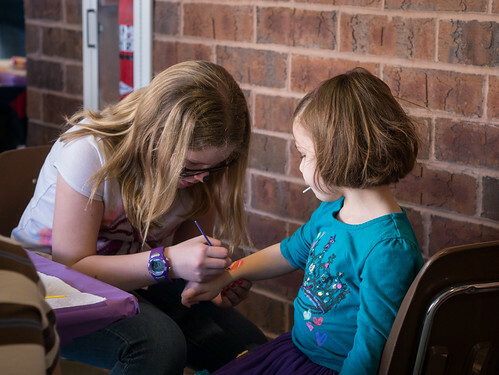 There were a couple of moon bounces, face painting, a lot of crafts, cookie decorating, and more. 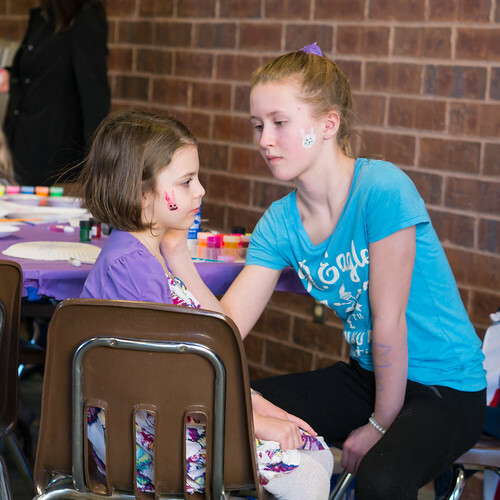 Upon arrival, the girls went straight to the face painting. 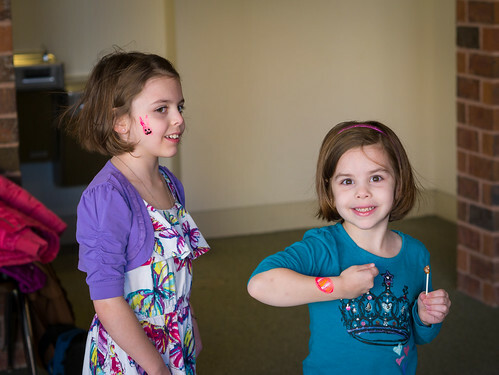 Leah opted to have an egg painted on her arm rather than her face. And Molly chose to have a bunny painted on her cheek. And here are the results (for a bit). Then Molly decided she wanted her other cheek done as well, so she headed back for another round. This time - a butterfly. 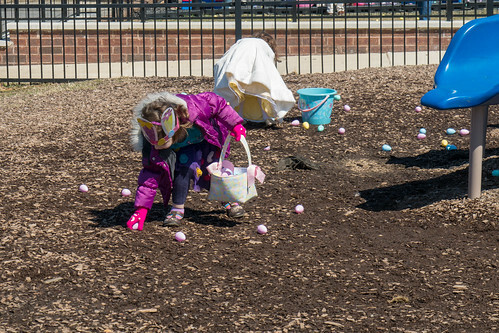 Of course, there was an Easter Egg Hunt. 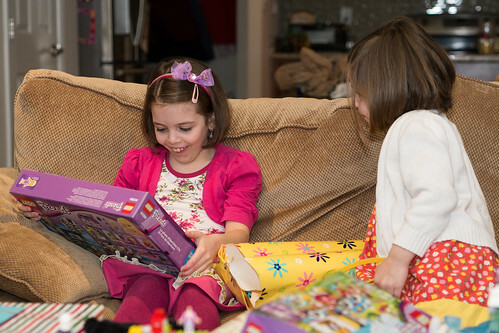 Leah was in the preschool area, while Molly went to the second/third grade area. 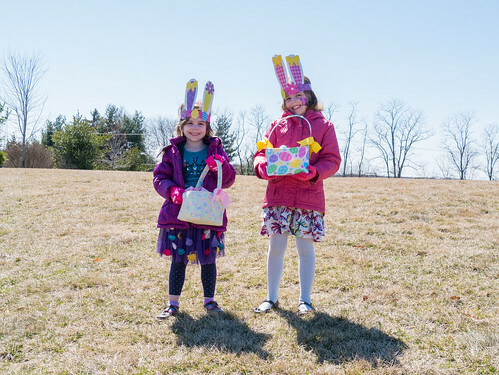 Full baskets and bunny ear crafts on their heads serve as evidence of a fun afternoon. We got together for dinner with my side of the family to celebrate Molly’s birthday at a different restaurant this year. Usually, Molly wants to go to Red Robin since they sing. At the urging of some of the older attendees, she said she decided this year we’d go some place with tacos. Jen called around and found that they would sing on weekends at La Palapa, a local Mexican restaurant. 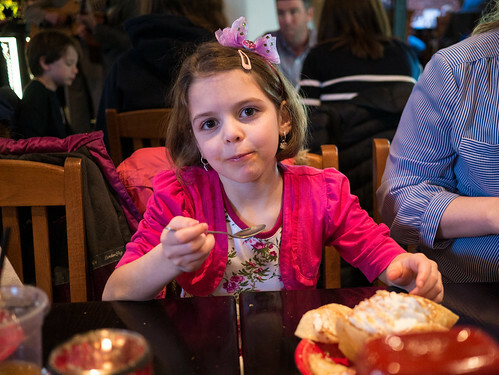 It was awesome - good food and great singing (including the sombrero she was hoping for). Here’s a taste of the birthday singing. I obviously had trouble recording this. I'm not sure I should even bother posting it, but it's short and gives you an idea of how great it was. After dinner out, we headed back to our house for cake, ice cream, and of course presents. 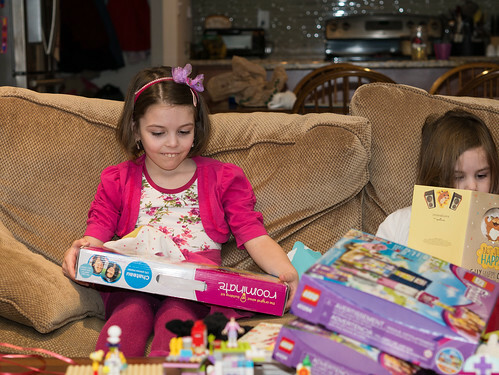 This was a gift we hadn’t heard of, but the girls have really enjoyed it since opening it up and starting to build.